Love it! Easy cakes, easy desserts! On the perfect party menu, dessert is a must! Depending on your guests, dessert can be the "star of the show". Plan a simple menu and go all out for the sweet finish. These cake and dessert recipes are easy peasy! Helpful hints and make ahead advice are included. This Spiced Coconut Cake recipe is a tropical twist on an old favorite. Rich with coconut, sweet spices and nuts, this will be your new all-time favorite cake recipe. Serve with sorbet or soft whipped cream. Be careful not to overcook the coconut cream/egg mixture or it will curdle. If it does, pour the hot mixture into a blender and puree at high speed until smooth. 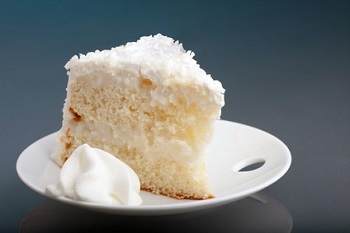 To toast the coconut for the outside of the cake; spread coconut out on a baking sheet and toast in a 300F degree oven for about 10 minutes or until golden brown. Stir often. Cool before applying to cake. Preheat oven to 350F. Set oven rack at the middle level. Into a medium-size bowl sift together the flour, cardamom, cinnamon, cloves, nutmeg, baking powder, baking soda and salt. In a large bowl of an electric mixer, beat the butter with the sugar until fluffy. Beat in the eggs one at a time, beating until smooth after each addition. Beat in the vanilla extract. Beat half of the flour mixture into the butter mixture and continue to beat until smooth. Beat in the sour cream, then the coconut and finally the remaining flour mixture. Stir in the toasted nuts until well distributed. Divide the batter evenly between the prepared pans. Bake for about 25 minutes or until the cake are firm in the center. In a small saucepan, bring the coconut cream to a boil over low heat. Meanwhile, beat the eggs together in a bowl. Whisk the boiling coconut cream into the eggs a little at a time and return the cream/egg mixture to the saucepan. Cook over low heat, stirring constantly until the mixture is slightly thickened. Strain into bowl and cool to room temperature. In the bowl of an electric mixer, beat the butter until soft and light. Beat in the cooled coconut mixture, a little at a time, until smooth. Mix in the rum and vanilla, a few drops at a time. Easy Rum Orange Cake is a delightful mix of flavors with a rich and delicious texture. This cake can be made 1 day in advance. Cover with plastic wrap and store at room temperature. For more rum flavor, add 3-4 tablespoons of rum to the cake batter and either leave in, omit or decrease the rum from the glace. Grease a 10-inch Bundt pan. Preheat oven to 325 F .
In a large bowl, stir together cake mix and pudding mix. Add 3/4 cup orange juice, oil, eggs and lemon extract. Beat on low speed until blended. Scrape bowl, and beat 4 minutes on medium speed. Pour batter into prepared pan. Bake in preheated oven for 50 to 60 minutes. Let cool in pan for 10 minutes, then turn out onto a wire rack and cool completely. Preheat oven to 350ºF. Grease and flour a 10 inch Bundt pan. In a large mixing bowl, combine cake mix, pudding mix, sour cream, eggs, oil and coffee liqueur. Beat on low until ingredients are well blended. Beat on medium until well mixed. Fold in chocolate chips. Batter will be thick. Spoon into prepared pan. Preheat oven to 350°F. Grease and flour two 9" round cake pans. Combine cake mix, eggs, bourbon, cold water and vegetable oil in large bowl of mixer. Beat for 2 minutes on high speed until very light. Pour into pans. Bake for 30 minutes or until tests done. Cool in pans 10 minutes. Remove cakes and cool completely. Split layers in half horizontally. In large mixing bowl, combine whipping cream, cocoa, powdered sugar and vanilla. Beat until stiff then fold in the bourbon. So simple, so rich, so fabulous! Garnish each ramekin with a few raspberries and a mint sprig, and serve chilled. Creme brulee can be made up to 2 days in advance, covered and stored in the refrigerator. Position a rack in the center of the oven and preheat the oven to 300ºF. Arrange 4 ¾-cup ramekins or custard cups in a 9 x 13-inch baking pan. In a medium-sized bowl, whisk the egg yolks and sugar until frothy and smooth. In a 2-quart saucepan, bring the whipping cream to a simmer over medium-high heat. Remove from heat, add the white chocolate and let sit for 1-2 minutes. Whisk the mixture until the white chocolate is smooth. Gradually add to the egg yolk mixture, whisking continuously until smooth. Add the vanilla extract. Divide the custard among the ramekins. Pour boiling water into the roasting pan (do not allow any water to fall into the ramekins) until the water is halfway up the sides of the ramekins. Bake until the custards are firm yet jiggle slightly when shaken, about 45 minutes. Remove from the oven and allow to cool. Cover with plastic wrap and refrigerate until well chilled, at least 2 hours. Just before serving, preheat the broiler and sprinkle 1 teaspoon sugar over each ramekin. Place under the broiler until sugar has caramelized, watching closely to avoid burning. For best results, use a small, hand-held torch to melt sugar. Re-chill custards for a few minutes before serving. 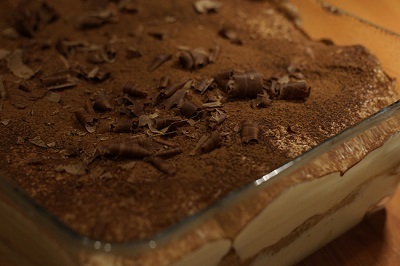 Tiramisu means "pick me up", which make sense since it contains coffee. This luscious dessert is not as complicated as it may sound. Mascarpone cheese is an extra thick Italian cream cheese found in your grocers deli cheese case. If not available, use softened cream cheese instead. In the bottom of a 13x 9 x2 inch baking pan or serving dish, place half of the ladyfingers in a single layer. Sprinkle ladyfingers with half of the coffee. In a large bowl, beat the mascarpone cheese and the sugar until light and fluffy. Beat in the coffee liqueur and vanilla extract. In a separate bowl, beat the whipping cream until stiff peaks form. Carefully fold the cream into the cheese mixture. This dramatic but easy dessert is the perfect ending to a dinner party. If you're pressed for time, use a purchased chocolate pound cake. Trifle can be prepared 1 day ahead and kept refrigerated. The chocolate cake can be prepared 1 day ahead. Cover with foil and store at room temperature. Preheat oven to 375°F. Butter and flour a 9-inch square baking pan with 2-inch-high sides. Melt 1 1/2 ounces chocolate in top of double boiler set over simmering water, stirring until smooth. Remove from over water. Let cool 10 minutes. Beat cream in large bowl until stiff peaks form. Spoon 1 1/2 cups whipped cream into bottom of large glass trifle bowl. Sprinkle with 1/2 cup toffee bits. Crumble 1/3 of cake over toffee. Repeat layering of whipped cream, toffee bits and cake, creating 3 layers of each. Spoon remaining whipped cream over top, spreading to cover. Cover trifle; refrigerate at least 4 hours. Sprinkle trifle with chocolate shavings and serve. To make this Spanish Flan recipe, use a traditional Spanish flan mold OR eight 6 oz. ramekins OR one 2 quart baking dish. Dish should have at least a 1 ½ depth. Use a 13x9 dish for the water bath. up the sides has been lightly coated with the caramel. If the caramel thickens and becomes sluggish, gently heat the mold in a pan of hot water or over low heat, depending on the material, and continue the coating action. Set aside to cool. Put the milk, salt, sugar, and cinnamon or vanilla into a saucepan and bring slowly to a boil, stirring until the sugar has dissolved. Continue boiling slowly, taking care that it does not boil over, until the milk has reduced by about 2/3 cup. Set aside to cool. Place an oven rack on the lowest rung of the oven and heat to 325 F.
Beat the eggs and yolks together and stir into the tepid milk. Pour the mixture through a strainer into the flan mold and place it in a hot water bath in the oven. Test after 2 hours with a skewer or cake tester; if it comes out quite clean, the flan is cooked. Remove from the oven, but allow to sit in the water bath for about 15 minutes longer. Remove and set aside to cool completely before refrigerating. Tequila-Flamed Mangos is a toothsome Mexican dessert recipe reminiscent of Bananas Foster except the fruit is slowly-baked, producing a buttery, lush sauce. Although this dish is best prepared and served within a few hours, you may bake the mangoes 1 day ahead. Cool and refrigerate, well covered. Reheat in a microwave or low oven before flaming. Heaven help us, but you can also use a similar amount of unsweetened jarred mango slices, well drained. You may need to reduce the cooking time by 5-15 minutes. Preheat oven to 350F. Peel mangoes with a sharp paring knife and slice into 1/2 inch wedges or chunks. Place the butter in a baking dish and place in the oven to melt the butter, about 5 minutes. Add mango pieces and sprinkle with the brown sugar. Stir to coat the mangoes completely, then spread out evenly in the dish. Bake about 30 minutes, shaking the dish occasionally to prevent sticking. Just before serving, pour the tequila into a small saucepan and slowly heat over a low flame. Do not allow the tequila to get too hot because the alcohol will burn off and it will not flame. Sprinkle the hot mangoes with the granulated sugar. Pour the tequila over the mangoes and quickly light it with a long kitchen match or butane lighter. When the flames subside, spoon mangoes into serving dishes and serve as above. Peanut Chocolate Cookies have salty crisp peanuts, creamy peanut butter chips and of course, chocolate---totally addictive flavors in one little cookie. For a variation, use two cups of peanuts instead of the peanut butter chips. The cookies can be stored in an airtight container for up to 3 days. Preheat the oven to 375º. Lightly butter 2 large baking sheets. In a small bowl, melt the chocolate over a pan of simmering water; let cool. In another small bowl, combine the flour, cocoa, baking soda and salt. In a large bowl, beat the butter until light and fluffy. Add the brown sugar, granulated sugar and vanilla and blend until smooth. Add the melted chocolate, whole eggs and egg whites and mix until incorporated. Stir in the dry ingredients just until combined. Add the peanuts and peanut butter chips. For each cookie, scoop a scant 1/4 cup of the dough onto the prepared baking sheets, leaving about 2 inches between the cookies. Bake for 10 to 12 minutes, or until just set in the middle; bake about 3 minutes longer for crisper cookies. Transfer to a wire rack to cool. Don't be put off by the different steps involved in this biscotti recipe. These crispy cookies come together easily and are superb for dunking in your morning coffee or as a light dessert. Preheat the oven to 400º. Toast the walnuts for about 8 minutes, or until golden brown. Let the nuts cool, then coarsely chop them. Lower the oven temperature to 325º. In a large bowl, sift together the flour, baking powder and salt. In a large bowl, cream the butter with the sugar. Beat in the eggs, 1 at a time, blending thoroughly after each addition. Add the vanilla. Gradually stir in the flour mixture, then fold in the nuts and the chocolate until just blended. Divide the dough into 4 pieces and shape each piece into a 12-inch log. Set the logs on 2 lightly buttered baking sheets and refrigerate until chilled, at least 30 minutes. Bake the dough logs for about 20 minutes, or until they are firm and starting to brown. Transfer the logs to a rack and let cool slightly. Lower the oven temperature to 250º. Using a serrated knife, cut the logs crosswise diagonally, 1/2 inch thick. Set the cookies on their side on the baking sheets and bake for about 15 minutes, or until golden brown. Let cool before serving.